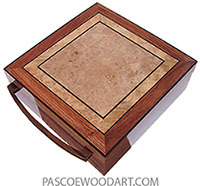 12-1/16" x 8-7/8" x 3-3/4"
This box is made of 1/8" shedua veneer laminated over cherry. 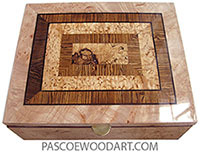 Top is from a fantastic piece of redwood burl. 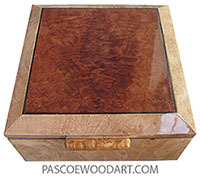 This box is made with an unusal bevel cut with the underside cathedral -like. Last updated December 13, 2012. Posted September 09, 2012.